When you love what you do, you can't help but to do a good job. We believe this is the reason Under Watercolours has been so successful. We cater almost exclusively to the dive, travel and marine industry. We are drawn to ocean related projects because it's what we love to do and where we want to be. Due to the many referrals we get from our satisfied clients, we have also worked in the movie industry, medical industry, real estate, and continue to develop new markets in other areas. A combination of over 30 years of computer graphics experience, a lifetime of photography experience, and a God given artistic talent inspires Bonnie Pelnar, founder of Under Watercolours to produce graphic projects unmatched in the industry. It is our policy that a job is not finished when we have simply met the customers requirements, it's finished only when it passes her strict design, quality and performance standards. We also believe that it is important to share the beauty of the oceans to educate and encourage others to protect her and her inhabitants. We hope to help teach more people of the importance of keeping our oceans healthy and develop alliances with reef support and research foundations and organizations whenever possible. Our clients come from all over the world. Most of those who have worked with us in years past remain our clients today. We maintain a trusting and loyal working relationship and many clients have also become close friends. We enjoy their success almost as much as they do, because we know we've supported them as fairly and honestly as we could. We would love to add you to our family. 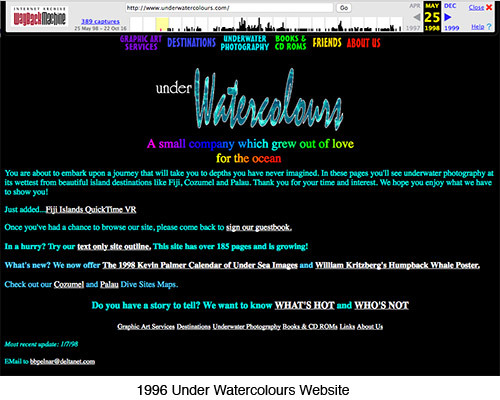 Under Watercolours is a federally registered trademark.